How the Garden Does Grow! A hot day today with extremely high humidity makes it an impossible day to garden. Even going out to hang laundry to dry I am soaked with sweat within minutes. In spite of the breeze the air is oppressive and I get hotter and hotter so that returning indoors feels so very good. It is unfortunate to not be able to work outside as there is so much to be done, so many weeds to pull. There are peas to pick as well but it is just too hot. Perhaps later this evening before the thunderstorms arrive there will be a bearable window for pea picking. All the black raspberries have been picked and we have a very full pint. So many have mentioned they had ever heard of black raspberries before and wondered what they taste like. They do not taste like your regular red raspberry, not even close. The nearest thing I can liken their flavor to is concord grapes; sweet but a little tangy too with perhaps a hint of blueberry. How’s that for a precise description? Someone totally needs to hire me to write for their garden catalog! picked and then it will be time to figure out how to make them into jam. I picked the few remaining red currants and popped one in my mouth to try. They are supposed to be not as tart as black currants. Now I have only every eaten black currant jam and had dried black currants, nothing fresh picked. The red currant was tart but not unpleasantly so. What was a surprise was the seeds. Three or four rather large ones. Currants are small enough as it is, now I find out they are at least half full of seeds inside. The red ones are anyway. I have not yet had any fruit on my black currant. So when jam making with the currants, gooseberries and elderberries, I can look forward to straining out seeds. It had better be worth it! With this heat the zucchini is really taking off and is covered in yellow blossoms. The cantaloupe is flowering too. And finally the tomato plants we started from seed are growing well. All of the bell peppers, however, are either dead or stunted and sickly looking for no reason that I can figure out. So earlier in the week we cleared the garden space and I planted turnips and some more radishes. Speaking of radishes, one of the varieties I planted this year are purple all the way through, malaga they are called. They grow well and unlike the red ones which have a tendency to split, stay round and firm. They do, however, have a bit of bite to them, not so hot to make your mouth burn but enough to make you take notice. Crunchy and a little peppery, they are marvelous sliced up on a sandwich with tofu or tempeh. I wouldn’t want them in a green salad though, I don’t think they would play well with mild flavors. Of course, you might think otherwise if you are a hot radish fan. Regardless, I highly recommend growing them if you have a little patch. Are there potatoes under all that straw? 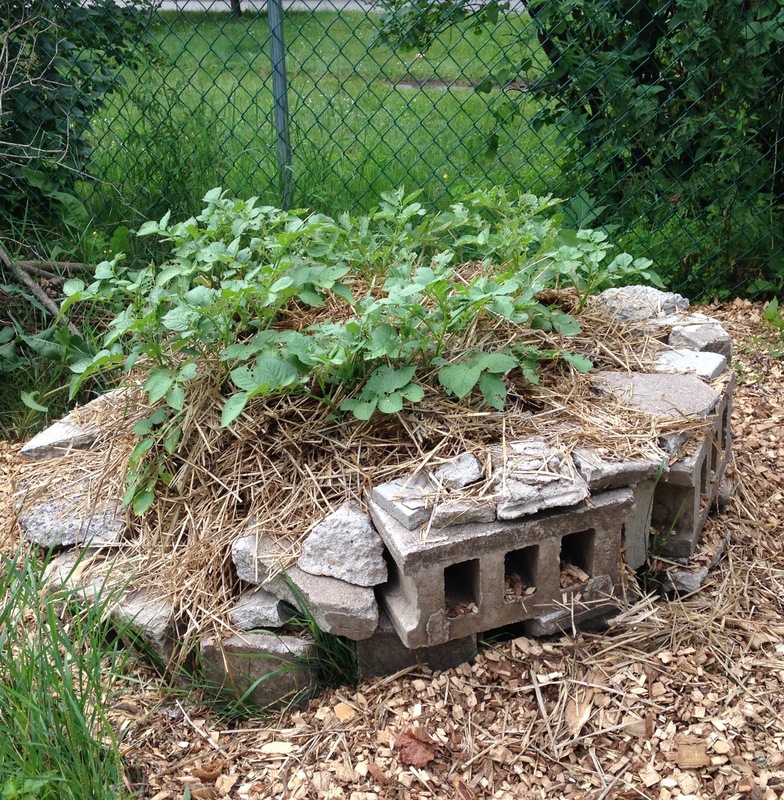 The potatoes are also growing like crazy. This is the first time I have grown any so I hope I am doing it right. I keep mounding up straw and the plants keep getting taller and taller and I add more straw. Are there potatoes in there under all the straw? I hope so but I won’t be able to find out until after the plants begin to die back. That doesn’t look like it will be very soon but I can’t say for certain. I just watch and mound up straw and wait and hope for the best. A lot like most things I do in the garden. Squirrels and rabbits have been a bit scarce around the garden lately. Why? Remember the hawk nesting in my neighbor’s tree? There is now a baby. It can kind of fly between the nesting tree in the backyard and the big oak tree in my neighbor’s front yard. 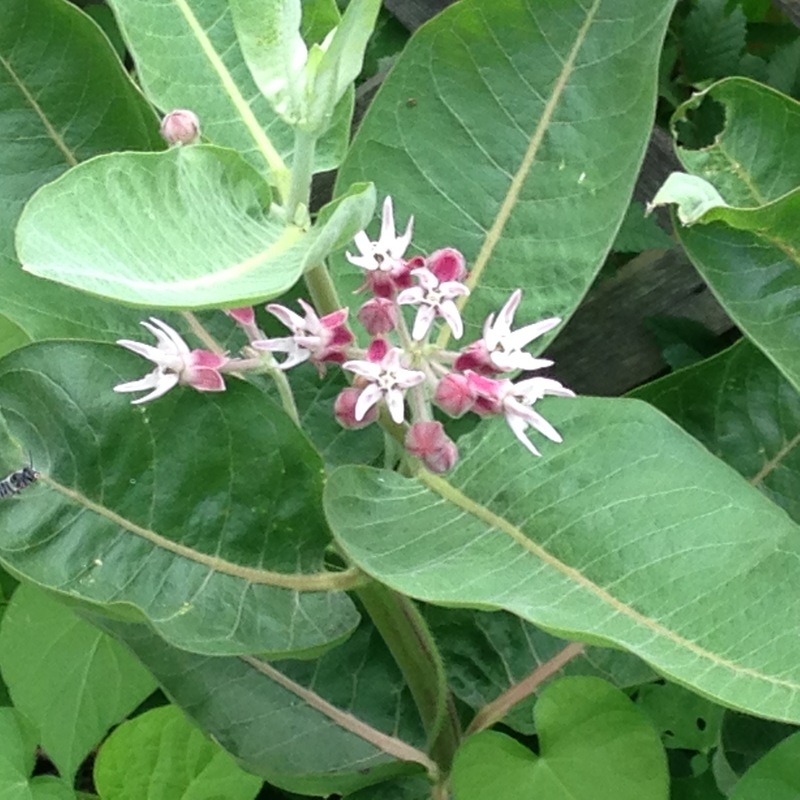 I haven’t managed to see it yet, it is careful to keep hidden in the leaves. I can hear it just fine though. Hawks aren’t songbirds and don’t tweet or chirp. So imagine the sounds you’ve heard raptors make, scale it down and raise the pitch to that of a squeaking door and you will come close to what this baby sounds like. And it being a hungry impatient baby it makes quite a lot of noise! Still, it is great fun having it around and I wonder if the parents will return to nest in the same place again next year. If so, I will have to be very careful that my chickens don’t give the impression of being a good dinner. have already begun to sprout, I did not have high hopes for the ability of anything desirable to grow in all that sand. But Friday I went out to check and there were sprouts! I watered them, then watered again yesterday, and today they are coming up really strong. Hooray! 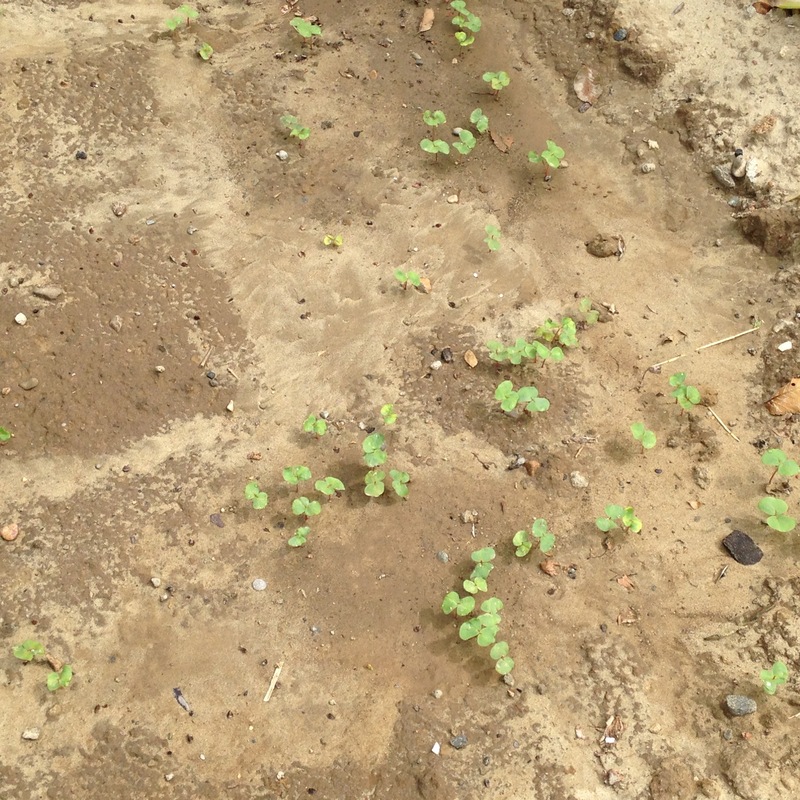 It’s going to take more than buckwheat sprouts to make the sandbox a garden, but it is a beginning. Another crash-free week for me and Astrid. The riders in the Tour de France have not been so lucky. There have been loads of crashes and a number of riders have had to drop out because of broken bones. Yikes! My scrapes are almost all healed and my bruises have turned all kinds of lovely colors and are just beginning to fade. I can wear a skirt again and not make people gasp in horror. It was a warm and humid day for my long ride yesterday (55 miles/88.5km) so I left a full hour earlier in the morning than usual. I felt really good and was sure when I was done that my sprint intervals would have gotten me personal best times and that I surely had managed to average 15mph/24kph, a goal I have set myself as I have been hovering so very close to it for the last few rides but not quite making it. Well, once my ride data was uploaded I found I didn’t make it yesterday either. Nor did I get personal bests. I did beat my QOM time on my favorite hilly segment by four seconds though so that was something. Still, I was a bit disappointed. Even though I felt good I guess the humidity had more of an effect than I expected. Oh well, there is always next week when I will try again! Have any of you ever ridden in a Gran Fondo? 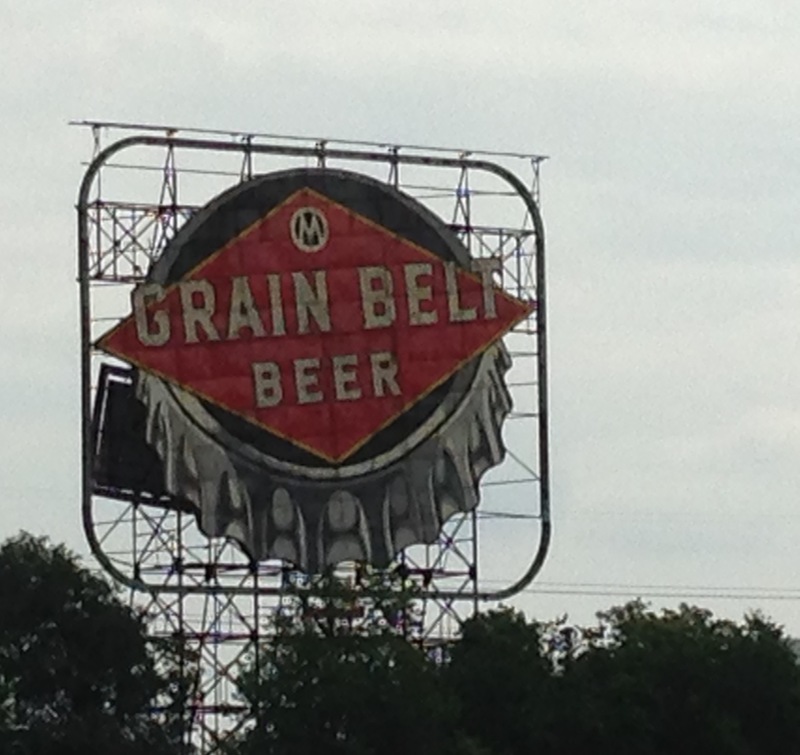 There are three in Minnesota that I have recently discovered. They aren’t exactly races but they are run like races and riders get a tracking chip and are timed. It’s like the chip runners get in their timed “race” events. There is a Gran Fondo in April as part of the Ironman bike ride. There is the Fulton Gran Fondo in May sponsored by the Fulton Brewing company in Minneapolis. The ride is followed by a beer festival and event participants get a coupon for one free beer. Then in September is the Life Time Gran Fondo sponsored by Lifetime Fitness and the Waconia Brewing Company. What’s the deal with bike events and beer? I don’t drink alcohol so I am a bit mystified. Anyway, the September ride is 60 miles/96.5km and I believe one or both spring rides are 100 miles/161km. The Life Time Gran Fondo is a week after my 62-mile/100km Jesse James Day ride. I am tempted to do it. For my $40 registration fee I get a t-shirt, a beer (or a root beer), live entertainment at the finish line festival as well as a fully supported ride that includes aid stations (snacks!) and bike assistance. Plus, since it is timed, I suspect I will get a ranking among finishers which is very motivating because, as I have mentioned before, I’m kind of competitive. Plus again it will give me extra incentive to keep working on improving my average speed. What do you think? Should Astrid and I go for it? booksandbuttons, it’s a great sign and sits just above the Mississippi River. I’m glad it has been preserved. Definitely do the Gran Fondo! I’ve never done one yet. Ours are over various terrain which isn’t really appealing to me. Maybe one day…. Helen, I don’t know what the route for the Gran Fondo is like but they also have a family route which generally has overlap because they close roads. So it will be a fun an unknown adventure to try! Go for the Gran Fondo Stefanie…you will do splendidlyl! Black rasberries sound rather fascinatingly delicious! The weather sounds a bit grim in Minnesota. In UK we had a mini heatwave the other week which was a bit of a shock to the system (we are supposed to get more at the end of the month). Biking has become very popular indeed in the UK but our events seem a bit wimpy compared to Gran Fondos and Jesse james! Ian, oh they are! The weather is typical summer. I should be glad it took as long as it did to get to this point. The good thing is that it doesn’t last for long most of the time. I heard about the heat in the UK, I can imagine it was a bit of a shock there. You have such beautiful and varied country to cycle in I am surprised there aren’t more robust amateur events. What a shame about that. 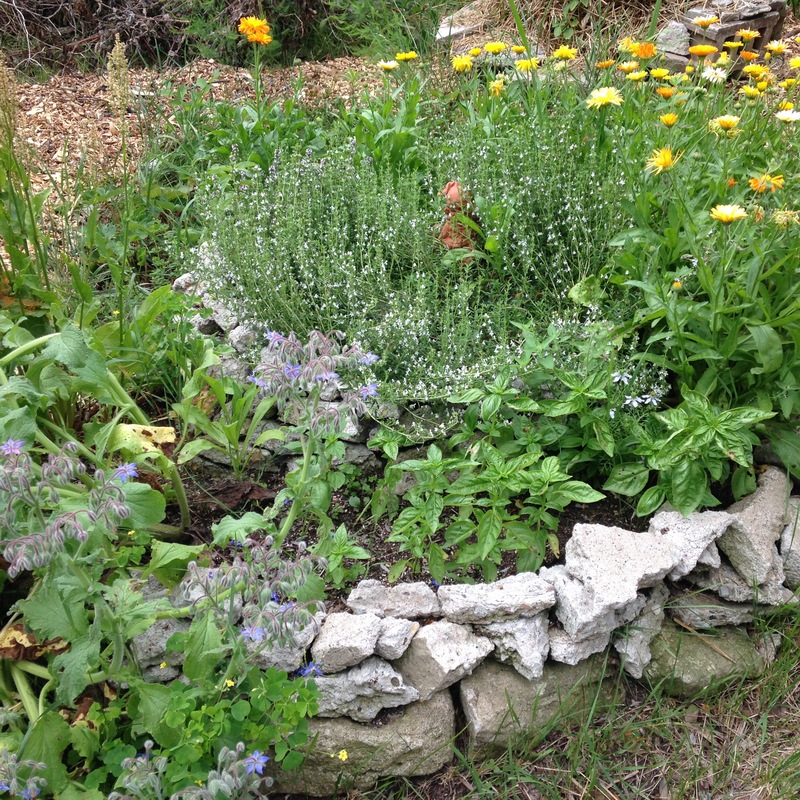 The spiral herb garden is gorgeous! My very favorite herbs are rosemary and basil, but I have a love affair with all herbs. Now that the rains have finally ceased, my battle with slugs and snails seems almost winnable. The little beer traps have taken care of hundreds, and are never empty. Good thing my husband only drinks about half a can at a time; I can almost always refill my little dishes of drunken death. jenclair, thanks! The herb spiral is looking pretty good this year. There are six basil plants in there, lemon grass, winter savory, thyme, sage, black cumin, borage, French sorrel and an abundance of calendula. The slugs and I are battling it out over the potatoes. It’s a neck-and-neck race at the moment. This is the first year I’ve really had a slug problem so I am rather annoyed! I am so envious of your garden. You’re growing so many neat things. Jack would love the purple radishes. There are also yellow raspberries, or at least they used to show up in the plant / seed catalogs when I was gardening. Your garden sounds like a good old-fashioned garden. When I was growing up in the 1950s, older people often had wonderful gardens in their backyard. The elderly couple across the street that I adopted (mostly for their dog, Butch) had currents and gooseberries and potatoes and fruit trees. It was so exciting to help harvest the potatoes. In the backyard of the house my parents rented, we had a grapevine, and apricot tree, a sour cherry tree, and all the vegetables my parents planted. How lucky you are to have the hawks! Except I’d rather not be around when they’re looking for dinner. Maybe you’ll need a big dog to guard your chickens! Joan, yes, I’ve heard there are yellow raspberries but I think those are bred that color? Black raspberries are their own thing but I think I read somewhere they sometimes might produce yellow fruit so maybe the yellow raspberries are bread from black? Who knows! Anyway, I suppose I do have kind of an old fashioned garden. It maybe comes from learning to garden from my grandparent and parents all of whom grew up on farms. The hawks are really neat. I actually saw the baby for the first time this morning, it took a flight practice rest break on my deck railing! The cats were beside themselves watching it through the window. We’ve had so many black raspberries this year. It was awesome. They are winding down just as the red ones are ripening. The voices calling for red raspberry sorbet are getting louder and louder in the house. And by the way, red currant jam is totally worth the work of straining the seeds out! TJ, this is the first year I have had them, I just planted one last year and I am so glad I did. They are truly delicious! I think I like them better than the red raspberries and I might just have to make room in the garden to plant another patch. I will trust you that red currant jam is worth straining out the seeds! I’m sure you’ll find your shed easy to put together. Having pre-drilled holes is half the battle. We’ve put a couple up over the years. piningforthewest, you give me a confidence boost! Thanks! Why wouldn’t you go for it? If Astrid says yes, so do I.
I look forward to your report of shed building. Hope it’s not too hot for it. Summer has definitely arrived and it will be hot for shed building but there will be lots of ice water at hand and knowing Bookman, plenty of ice cream too! Danielle, I’m going to do it! I’ll be signing up over the weekend when I have time to deal with the registration form. 🙂 On the hot humid days I am grateful for having central A/C though I am not so very happy when I get the electric bill. I hope the jam turns out too. I will definitely let you know! Yup, lettuces are pretty much done, it’s all bolting (flowering) in the heat. Next up zucchini and green beans! Oh hey! I have a question for you! My mum has been trying to grow oregano for kind of a while, and it keeps dying. Is there a trick to oregano? Her other plants are growing very nicely, but the oregano just cannot seem to hang on to life! Jenny, hmm, oregano likes it warm and dry but not too dry and not too hot. In my garden it doesn’t really take off until mid-summer, about this time. It also needs a little room to spread out. It’s supposed to be perennial but I have yet to have it survive the winter here so I buy a new plant every year. This year I got a spicy variety that is an annual so when it doesn’t survive the winter I won’t be disappointed yet again. Hope this helps! Go for it! Have you thought about Ragbrai?